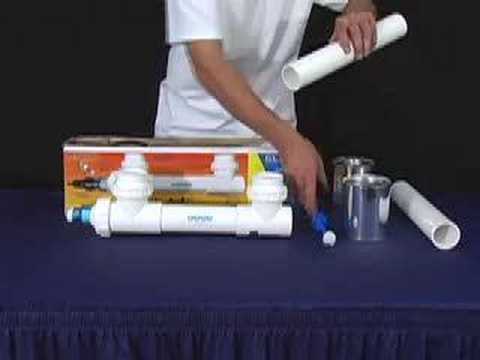 The Classic 15 watt UV is the premium choice for water sterilization of ponds/aquariums from 200 to 500 gallons eradicating bacteria and creating a healthy environment. Aqua UV Classic 15 watt UV Sterilizer WITH WIPER by Aqua Ultraviolet. The Classic 15 Watt UV sterilizer is designed for maximum performance, power, and reliability. Ultraviolet is a proven dependable and effective method of controlling algae and harmful bacteria without leaving any residuals in the water. The Aqua Ultraviolet Classic 15 Watt can also be used as a clarifier to remove free floating algae for bodies of water up to 2000 gallons with 50% to 75% plant coverage. Simply put Aqua Ultraviolet Classic 15 watt UV sterilizer will clear you water in 3 to 5 days, sometimes over night, and keep it that way.